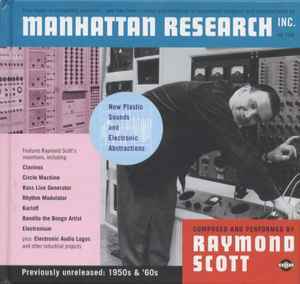 Raymond Scott ‎– Manhattan Research Inc. I bought a copy today, it sounds awesome, but it was from Music on Vinyl and standard black vinyl. Not on red, white, and blue. Anyone have insight? That version is not listed here. I just purchased the Music On Vinyl re-issue. The sound is good. I would like to know how the sound is on the Basta 2001 press though. Did anybody make the comparison? Raymond Scott ‎– Manhattan Research Inc. How would I explain this lp?... it's like a mixture of Ken Nordine, Aphex Twin and The Residents BUT it's not because it's the genius of Raymond Scott ! Just love these crazy adverts with bleeping analogue squelching melodies.